I have to be honest. I almost didn’t share this recipe with you guys. Because I was going to launch the Power Ball Super Dessert line and retire on an island, giving 50% of my Power Ball proceeds to charity. But I’ve decided my charity act instead, is going to be passing it along to you. Not that you are a charity act…really I’m way too busy to launch anything right now….but I will launch into how amazing these dessert are! 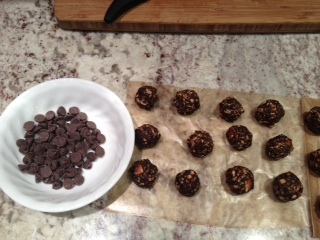 If a super health nut and a serious chocolate lover had 12 little delicious edible babies, that would be Power Balls! (Minus the weirdness of that concept). It’s my go-to “I’ll bring dessert” recipe, because I know it’s real, it’s healthy, additive-free, ridiculously scrumptious, and so rich you can’t eat too many. OK, you actually can, but it’d be hard if others are around, because they’ll be snatching them up so quickly. They are that good. The secret is….the measurements are flexible, I make them differently each time. So play around and see which combo/ratio you like best! The optional Ingredients are what give these tasty treats their power! Maca supports hormone balance, increases libido (hello!) and boosts your energy. Chia seeds and flax seeds are rich in Omega 3’s, protein and fiber, so include them! These are similar to the “candy” my wife makes for me very week (I limit myself to two pieces a day). 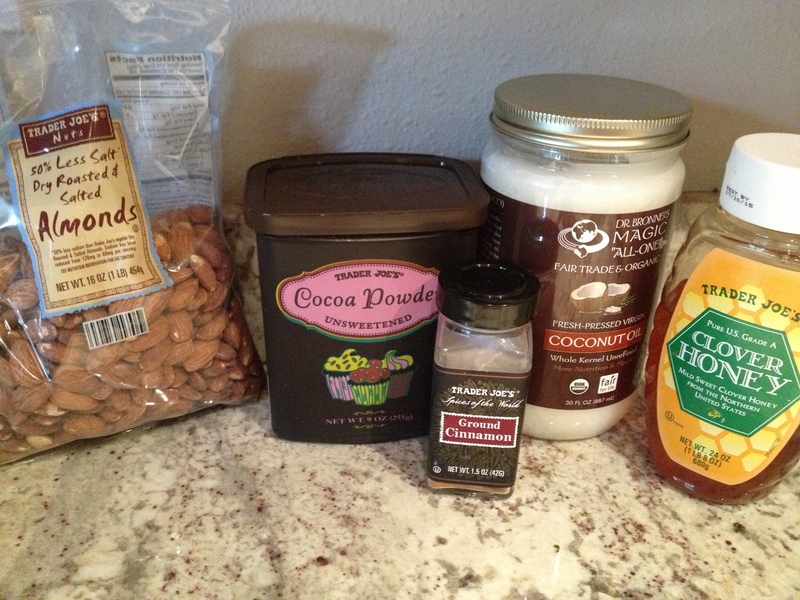 She uses raisins instead of the almonds and adds a bit of orange extract. By the way, instead of putting them on wax paper or foil she puts them into a silicone ice cube tray before they hit the fridge — then the pop out easily an hour or so later. Limit? Oh, man! How can you not eat the whole pan? And that’s a great silicone tray idea! Great idea! Ill try this–except the Hub has large “man cube” silicone ice cube trays—so I’ll have to get some smaller ones! These sound great. Thanks for posting! Especially since the Holidays are right around the corner! I love them! And interestingly they are the only dessert I love and don’t eat all of–perhaps be side they are so satisfying? Rich? I dunno? Enjoy!! Was reading your letter to your friend about leaving medicine to home school. I think that is super courageous and beneficial to you and your family in so many immeasurable ways. Kudos to you! Thanks! We are having a blast! WordPress didn’t notify me of a comment so I almost didn’t see this! But I came back to make this recipe! I made them with dried pineapple, cranberries and figs. Delicious! Friends on trip were almost fighting over the last ones. Any chance you got this recipe from Alec Baldwin? Ha! SNL fans get it. how have i forgotten about these. must make again asap. hope you are doing well! Have a new healthy power Bar recipe coming out in the next few weeks (gluten free, yummy, make and leave in the fridge to grab and go as needed, or crumble with yogurt) stat tuned! Previous Previous post: RANT: why simplify?